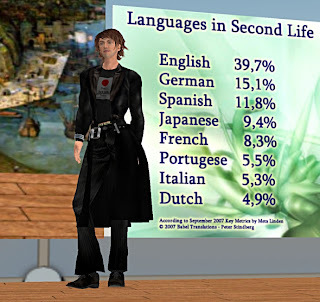 Last month I had a great time at the "monthly" Second Life bloggers party. And this month, I am looking forward to attending the next installment. Except I can't. Unfortunately, I will be in transit at the very moment of the event and no matter how hard I want, there is no way for me to connect. My avatar will sleep. No matter! As occurred last time there will no doubt be significant coverage of the event - what else would you expect to happen when you get a bunch of pen-happy bloggers together? Sorry guys, see you at next month's party! 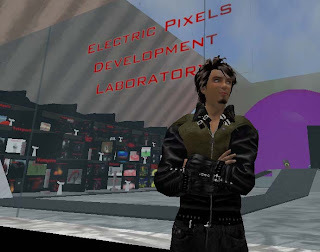 Also on the topic of Second Life bloggers, if there are any of you out there that have not yet joined the Second Life Bloggers Ning network, you should do so immediately! There are now 150+ members and I'm certain there are more out there that have not yet joined. Over the past few weeks I've received comments and even a few diggs from people who read my post on the disabled among us Second Life residents. 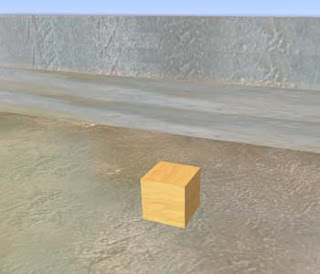 I didn't realize how many disabled were in Second Life, but it seems that there are far more than anyone realized. Let's find out. I've placed a poll on the site, which I ask all readers to fill out. It's completely anonymous, of course. It simply asks whether you categorize yourself as “disabled” in real life. In a week or two we'll review the poll's results and try to draw some conclusions. If you can, pass on the word about this poll to your friends and we'll try to get as many responses as possible to increase the accuracy of the results. Getting hit on by a beggar is not uncommon in Second Life, but twice today it happened in ridiculous places. Where does one go to escape them? Evidently Linden Lab keeps a "blacklist" of banned scripts. Each region's simulator checks the UUID of scripts against the master blacklist to ensure that bad-guy scripts are unusable across the grid. The BETA grid (a separate virtual world used to test radically new software in a safe manner) is currently testing MONO, a more effective script engine. One of the participants suggested that particles would require a lot of work on this new software. Now that got my attention! The notion of re-writing my 200ish particle scripts is a scary thought. As the meeting drew to a conclusion, questions for CG kind of petered out. Suddenly, a quiet guy in the corner spoke up and told the crowd that he's "looking for work" and is "available for interviews". Somehow his topic didn't really relate to the highly technical discussion up to that point in the meeting. Worse, when no one responded to his plea, he continued on, saying: "Anyone? Anyone? I need Lindens to have a place to live! ", "Boy, you guys must be rich!" and finally: "Please give me L$1000!!!!". Sad. Amusing. Pitiful. In spite of all that, the crowd was very polite and provided sage advice on where the best freebie shops could be found. Eventually he disappeared. Or ejected, I'll never know. After CG's meeting broke up, I decided I'd better test my scripts on the BETA grid, just in case I have months work of rewriting unbeknown to me. I'd never been to the BETA grid, and I landed on a small area of only four adjaecent sims containing some basic structures and facilities. I was mostly interested in the sandbox where I could perform the testing. I usually try not to test particles in public sandboxes, as they often attract a lot attention and I end up answering questions instead of building. On the lonely BETA grid the same phenomenon occurred, as I was approached by several gawking spectators wondering what was going on. A freebie-equipped standard avatar approached (not the one pictured here) and asked a few questions. Suddenly, she asked me, "can u borrow me some money?" And then I began laughing, a lot. Why? Because any money on the BETA grid stays on the BETA grid and won't transfer back to the main grid where it could be used to buy cheap hair and pole dances. Beggars in all places, even where money is meaningless. Familiar with clubs, Resident decides to create one of their own. A big one, of course. Actually, the biggest! Sigh. I’ve seen this happen several times, as many of my particle clients are club owners. Sometimes it’s quite sudden, while other clubs die a slow, withering death of agony. Why does this happen? I suspect a prime cause is a misunderstanding of the most basic business axiom: Revenue must exceed Expenses. I follow this rule absolutely, and I believe anyone who does can do nothing but succeed. That’s a fair bit of change for a very basic no-frills club. Not to worry, our Resident/Club-Owner needs only to offset these expenses by generating more than 275,000L each month. Oh. How do we do that again? Somehow I snagged an invite to this weekend's ultra-exclusive Linden "Concierge Party". The party is open to residents with monthly tier in excess of USD$125, and their guests. That's me, the guest. Someday I may require land of that size, but right now my store's portion of my parcel's capacity is only 700 prims and I simply can't justify anything bigger. Anyhow, back to the party. The theme of the party was "Ides of March", based on legendary Caesarian events. While I am sure someone will blog about the wacky events and amazing Toga-style activities, I want to talk about the amazing way Linden Labs handled the event. Back at my shop awaiting the opening of the party sims, I wondered how this was going to work. 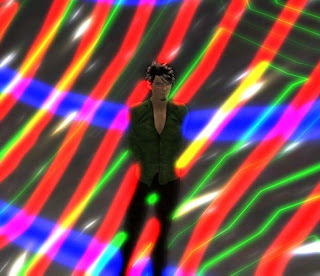 You see, the Second Life Group for the party held over 7,000 members. I mentally calculated how many sims would be required to hold this colossal event. Hmm, 7,000 attendees over 24 hours, with a maximum of 40 avatars per sim before they topple over due to extreme load. Dozens, at least. Yep, only five sims required to handle 7,000 potential visitors! How did they do it? My first clue was the avatar count in these sims. 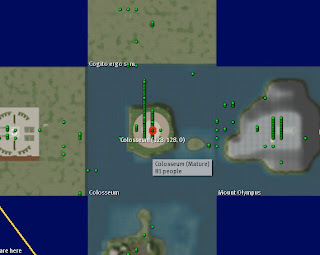 As you can clearly see in the image above, there were actually 81 avatars in Colosseum. A few times I've seen forty, but never 81! I was there. I saw them. I didn't count them, there were far too many. And get this - I was fairly easily able to move around and converse. At one point I was getting almost 30 FPS in a sim containing 68 avatars, although there were times my frame rate dipped down to the single digits. Limited number of visible textures. While the buildings were attractive, appropriate and useful, a careful inspection showed they made generous use of few textures. Good design! No floors. I noticed this immediately upon arriving: most things were simply set directly on the ground. First impressions were similar to seeing those awful "Yard Sales". There were hardly any prim-based walking areas, just dusty ground. Limited number of buildings and prims. The sims seemed empty, at least when I first arrived before they filled up with people. A check of the prim count in Temple showed 1235 objects of 15,000, 13,765 available. No wonder frame rates were fast: there was very little to draw! Havoc 4. The party sims were running the new Havoc4 physics engine, purported to be much more efficient. It certainly seemed to be. Even when things got a bit laggy, I was still able to move about without suddenly lurching forward, crashing into innocents and accidentally knocking them into a pit of doom. Top class server? I can't prove this, but I wouldn't be surprised if Linden Lab used servers with a bit of extra juice. Why not, if you are expecting 7,000 for dinner? Good building tips indeed, if your objective is to pack 'em in like sardines. Meanwhile, I'm wondering whether this experience tells us something about future sim performance. Perhaps someday I'll have 68 avatars strolling through my store! For now, I'll be happy with six. A very quick post today: I stumbled into a very interesting post by SLEntrepreneur, who interviewed my pal, SL translator extraordinary Peter Stindberg. Peter discusses various aspects of his translation business, which I believe will be of interest to Second Effects readers... at least the business types, anyway. The other night I made a mistake. A business mistake. Not a big one, but telling the story may help other business owners avoid a similar fate. It began as I was about to sign off after working on a new gadget in my Lab. I was very tired and sleepy, as everyone seems to be in Second Life lately. Someone was in the store buying a few items. I strolled over to thank them for their business, and she said, "oh can you help me?" Normally, this means the customer is interested in something that I don't sell. It's an opportunity to make something new. Something people might want. I encouraged her to tell me what she wanted. And so she did. Sort of. Her idea seemed fairly simple to build, so I decided to build it on the spot. "Real-time Building" is usually a lot of fun, and you can get instant feedback from the customer as you build things: "too big", "not orange enough", "too icky", etc. The build proceeded. Particle shapes were devised. Parameters tweaked. Parameters tweaked again. And again. And still more. Somehow the build just wasn't quite what was required. Many adjustments were made. I realized at this point that I did not quite understand what she was after, either because she didn't or couldn't say, or because I was too sleepy to hear it or probe for clarifications. As the tweaking continued, more requirements were stated. Some were easy to incorporate, so I did. Others were fantastically complicated, and would require hours more work. Finally, as sleep was about to overtake me, the item was finished. At least without the complicated add-ons. I noticed the clock said I'd been working on this custom product for a long time, and normally this implies a fairly high price. However, in the interest of speed I quoted a lowball price. She said, "omg - I don't have that much money!" But, it didn't work out that way. Instead, customer leaves with a product that is less than they imagined, and contractor (me) receives fewer Lindens than the work deserved. Moral of the story: agree first, then build. One more thing: Never, Never, Never do work-on-the-fly when you are sleepy! After a certain hour of the night, go dancing, chasing dragons or ride a teacup! Normally, this blog kinda wanders around different topics, mostly having to do with running Second Life businesses, tips, wacky ideas and my crazy adventures. This post is a little different and more serious. I was approached by a good friend who asked if I could promote a special charity event. And I agreed. The event is the "The Red Dress Event", being held on 29 March, 5PM SLT at the Legend Lounge. You can find the dance SLURL right here. "Bring a Date — It'll Glow Your Mind!" That's the slogan for a new Rezzable attraction entitled, "Tunnel of Light". What is it all about? Well, it's kinda like, a tunnel of light! Seriously, when I arrived I was extremely disappointed. Instead of seeing animated buzzing color textures and extravagant particle effects all around me, I somehow landed in a peaceful and pastoral meadow scene. I half-expected to see cows wandering in the vicinity. Thankfully, there were none, as they often deposit unpleasant surprises for those walking by. However, one item stood out: a red neon arrow, indicating I should traverse a path towards a pond. Being quite adventurous, I took the arrow's advice and ended up at a rather dull pond. Noticing a small item floating in the pond, I touched it. Then many things happened. Quickly. I fell down, up and through a myriad of brilliantly decorated light tunnels, ending up at a black/neon boarding area reminiscent of a DisneyWorld ride. A car-sized teacup slid up and stopped in front of me, and of course I jumped in. 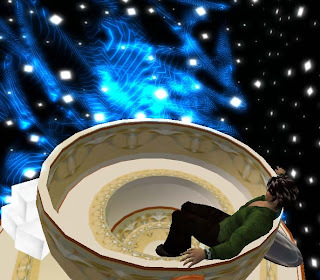 Ten seconds later, the teacup began a magical journey through numerous psychedelic zones, some of which included the most amazing texture animations I have ever seen. 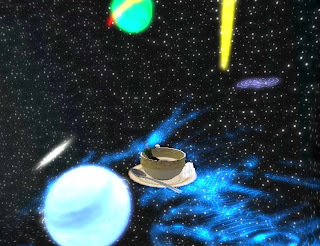 The teacup followed a wispy blue path through tunnels and into massive open areas, seemingly traveling between planets. At one point I moved through a forest that was made of, well, this is hard to explain, and impossible to photograph, but the "buzzing" textures made the forest look blurry. I've never seen anything like it. And glow! Things were glowing everywhere! Builder Spiral Walcher has taken advantage of the WindLight viewer in ways never seen before. Maybe I am crazy, but even my Group Tag was glowing! The preview of Tunnel of Light can be found here. Warning: you really must be WindLighted to get the full effect. Evidently the Tunnel will become a club later this month, I'd recommend you head down to the Tunnel of Light straight away - and unlike me, bring a date! 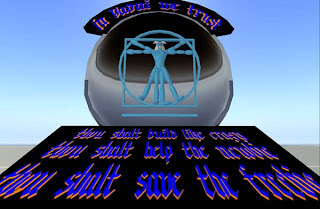 Every society sprouts a new religion from time to time, and Second Life is no exception. Yes, there are lots of conventional and unconventional religious activities taking place, but this week I came across a unique and purely Second Life-flavored worship area. 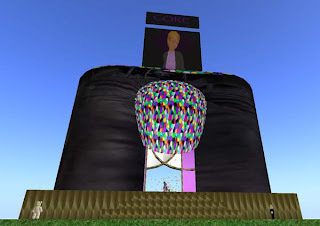 Gods of Second Life is based entirely on actual Second Life characters and phenomenon, as if we were suddenly hundreds of years into the future when today's issues and personalities had become legend. Uncle Phil is the Creator from who's loins the world of Second Life and Ruth, the All-Mother have spung. The bringer of Order from Chaos and Pixelated Reality from the Great Void. An effigy of Philip's pants is the shrine of Ruth. "Uncle Phil" is one of the three Major Deities, the others being "Ruth" and "The Great Corey". All the great features and personalities of Second Life are represented here, including Torley, Hippos, Lag, Crash, Linden Bears, Newbies and many others. I don't often post multiple pictures, since I fear the Internet will run out of online storage, but Gods of SL deserves many. 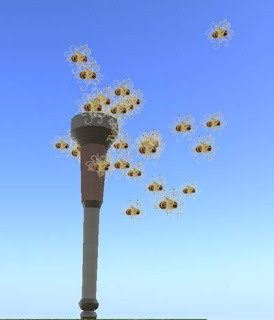 First, outside the temple is a monstrous torch, which looks eerily similar to the standard torch one finds in the default inventory, except that it oddly emits Flying Spaghetti Monsters. This is the altar for the God "Corey". Watch out for those noodly appendages! The main temple, which is itself a gigantic effigy of "Uncle Phil's" pants, is pictured above. Note the similarities between the temple and the "real life" Philip Linden - including that rather strange multicolored structure covering the naughty bits. The Goddess Ruth sits inside the temple, greeting visitors with her standard unchanging gaze. She's holding a Pastafarian torch very much like "Corey's". Pictured are Ruth devotees Infinite Graves and Marlee Theas, who have come to worship before Ruth's default chair. Ruth doesn't seem to move very much, but I am sure she is watching over us all. According to the legend, "If you are fortunate, you may glimpse her visage briefly as people of SL teleport in and out of areas". That's as good advice as I've ever heard for Second Life! Strangely, I follow them too. Most of them. Well, two. Near the temple is a very inspiring obelisk showing the default avatars on each side. 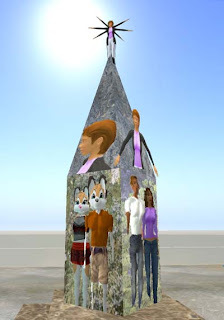 Male and female, human and furry, all equally represented on the different faces of the obelisk just as they are in-world. Seeing those all-too-familiar avatars stirred up uncomfortable memories for me... newbs just don't know how newb they are until it's too late. At least in my case. "Altar for LAGNOR, God of Lag. I would have finished it, but the sim is too laggy." 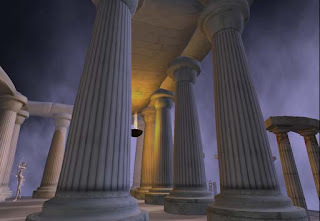 I haven't shown the Altar to Torley, the Hippos Bath or many other amazing items, but you can see them by visiting the Gods Of Second Life at this SLURL. When you arrive, choose "Gods of SL" from the teleporter and enjoy!